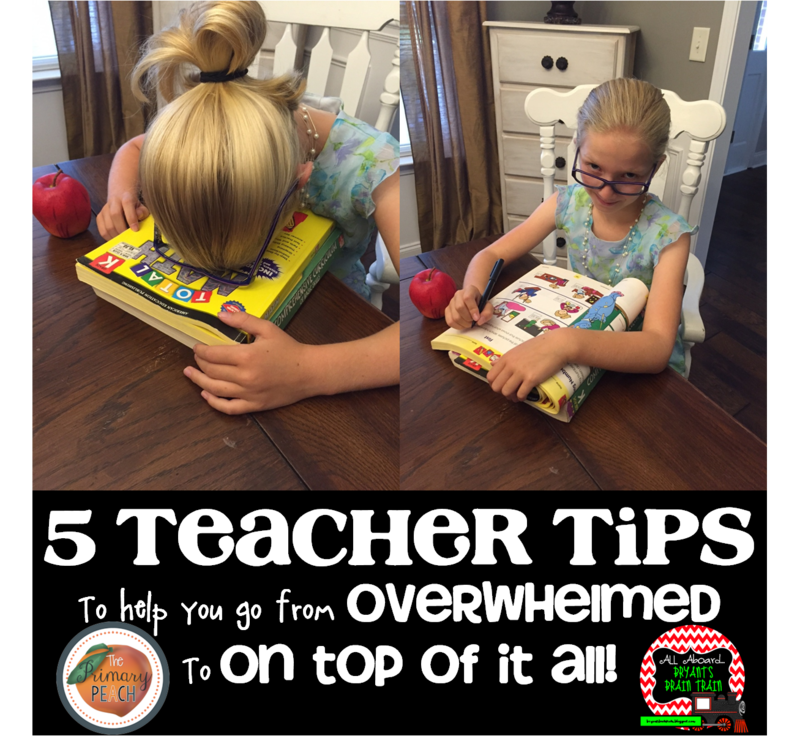 The Primary Peach: 5 Teacher Tips To Go From OVERWHELMED To ON TOP OF IT ALL! 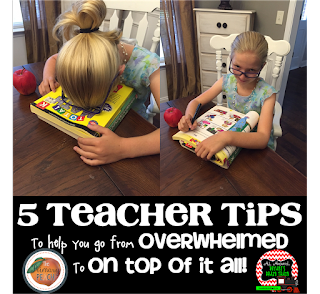 5 Teacher Tips To Go From OVERWHELMED To ON TOP OF IT ALL! Hi, friends! 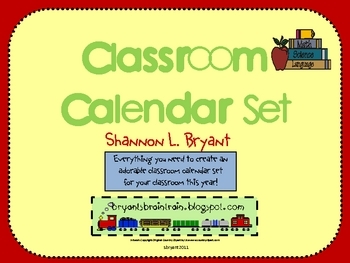 Shannon here from Bryant's Brain Train. It's the beginning of another school year, and for me, it's time to make some new SCHOOL YEAR RESOLUTIONS. Step 1 is easy...well, maybe easier said than done...putting things away immediately. PILING is definitely my default. If I am not sure where to put something, I make a pile. If I am busy, I make a pile. If I am procrastinating, I make a pile...you get the idea. Going through paperwork with a QUICK SORT is definitely the right approach. I ask myself, "What can I throw away immediately?" 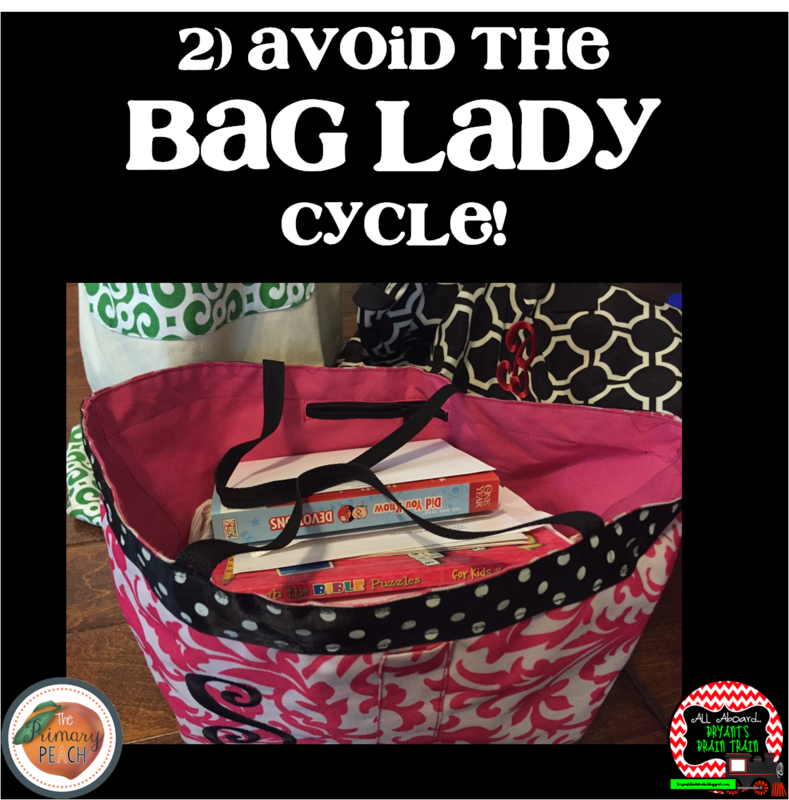 Getting rid of immediate clutter is a good way to quickly get ahead of the game! Step 2...true confession time...I don't just make piles on my desk. I also hoard paperwork and clutter in my teacher bags. And when I fill up one bag, I don't empty it. No, I find another one to fill up as well. 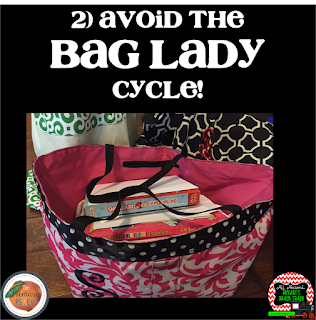 The picture you see here is the true story of my last year's struggle...3--count them--3 full bags of teacher trash and treasures. My name is Shannon, and I have a problem. Step 3--filing. 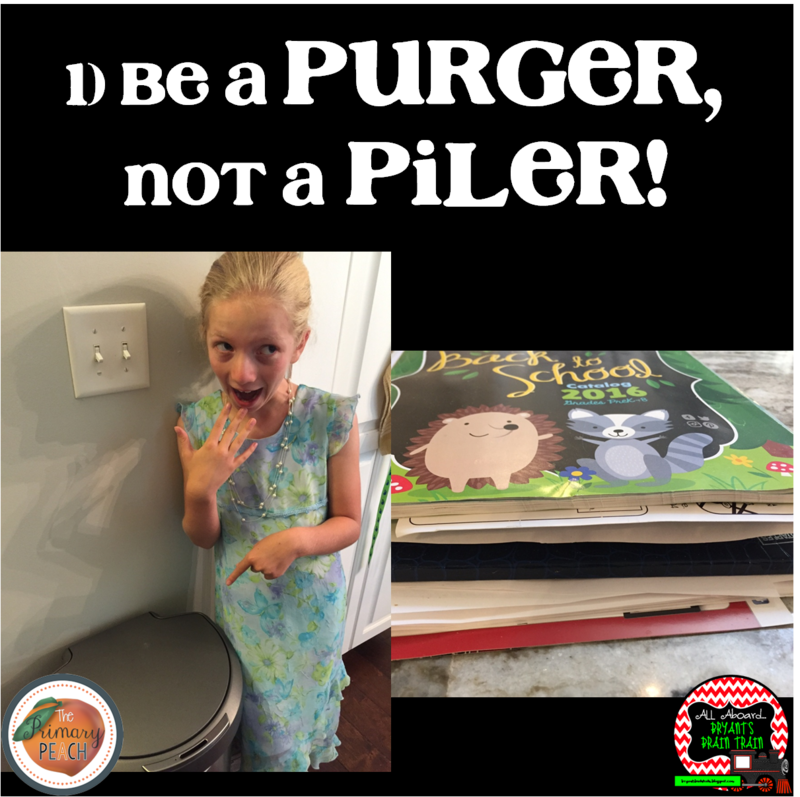 Besides purging unneeded paperwork, another helpful solution is to put things where they go. 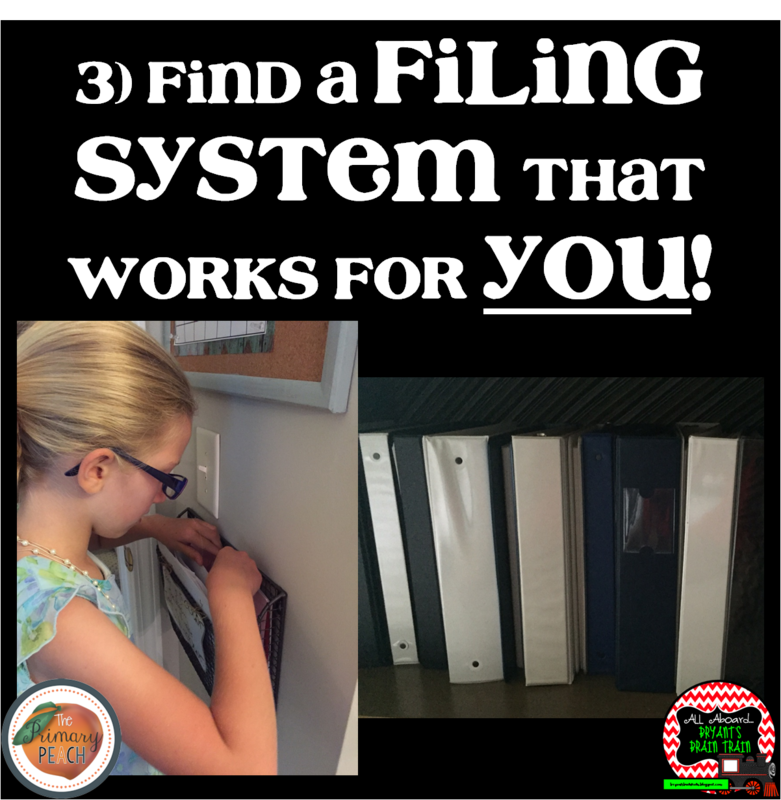 This is made significantly easier by having a filing system that works for YOU. 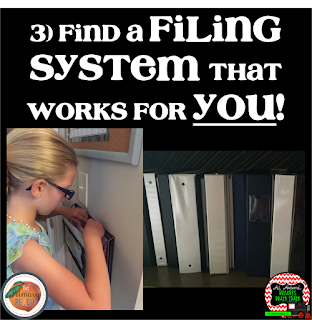 Whether it's binders, file cabinets, tubs, baskets, or digital computer folders, it is easier to put something away if you have a system that works for you, and you know where to put it. This is truly based on personal preference, so find what works FOR YOU and then FOLLOW THROUGH! Step 4...finding inspiration. When I realized that I needed a new system for a new year, I decided to visit one of my favorite stores in the whole wide world--Hobby Lobby--for some inspiration. These were some of my favorite motivational finds. 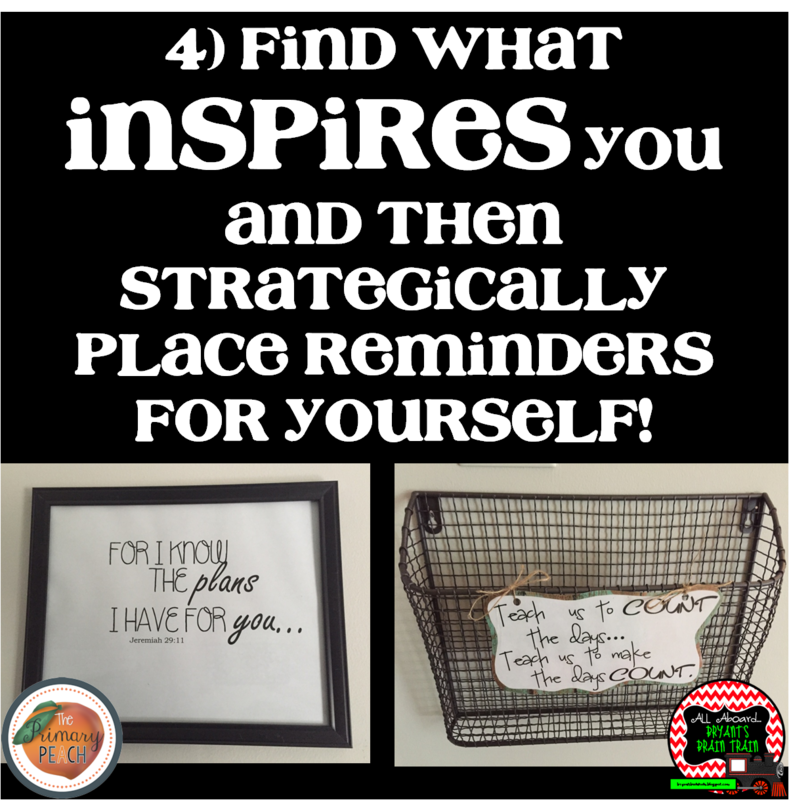 Whether it's buying a new calendar, hanging a quote, framing a family photo, or adding a postcard from a friend to a bulletin board, find something to inspire you and add it to your work area. 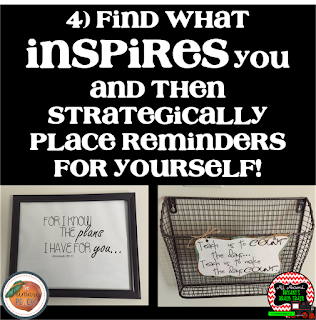 These bright spots of inspiration make me smile throughout the day and help me remember what's most important, even in the most stressful of times. Step 5...putting it all together. 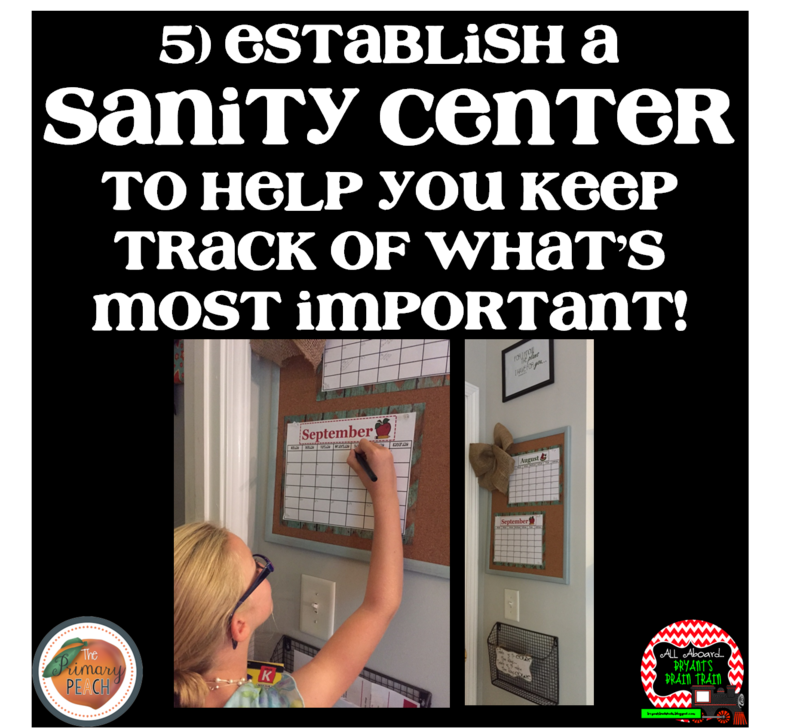 For me, this meant the development of what I'm calling my SANITY CENTER. Complete with calendar, a place for quick files, and some motivational quotes and typography, I've tried to put a system in place that will hopefully help me stay on top of the paperwork avalanche, as well as stay motivated and follow through as the year progresses. 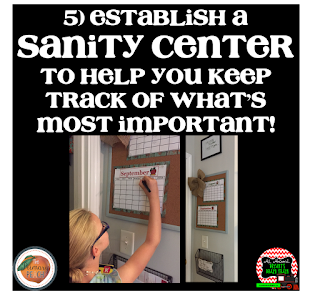 Interested in making a SANITY CENTER of your own? 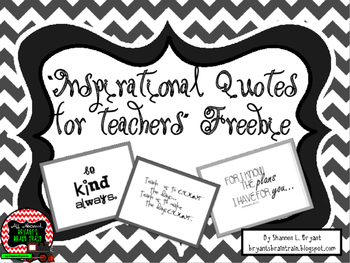 I've included a few FREEBIES to help you with this if you'd like to download them from my TPT store. Click the images here to grab them for yourself. I hope your school year is absolutely fantastic, and I hope today's post has helped you find some INSPIRATION for your ORGANIZATION! All the best!